As many of you know, the ESXi Embedded Host Client project is something that is very near and dear to my heart. I have always felt that we needed a simple web interface that customers can just point their web browser to an ESXi host after a new installation and be able to quickly get started. One of the biggest benefit in addition to simplicity is that it is also very intuitive from a user experience standpoint which I believe is very important in a world where things can quickly get complex. In addition, it can also provide an interface for basic troubleshooting and support greenfield deployments where vCenter Server has not been deployed yet. It has truly been amazing to follow the Embedded Host Client development from the initial idea to the first prototype built by VMware Engineers Kevin Christopher and Jehad Affoneh to its current implementation lead by Etienne Le Sueur and the ESXi team. I have really been fortunate to have had the opportunity to be so involved in this project. It is hard to imagine that in just little over 6 months, we have had had 5 releases of the Embedded Host Client Fling, all of which, produced with high quality development and rich feature sets. You can click on the links below to get more details about each release. I think its an understatement to say that customers are genuinely excited about this project as well, just look at some of the comments left on the Flings page here. Interestingly, this excitement has also been felt internally at VMware as well and I think this goes to show that the team has built something really special that affects anyone who works with VMware's ESXi Hypervisor. Although the VMware Flings program is a great way to share and engage with our customers to get early feedback, it may not always be a viable option. As some of you may know, Flings are not officially supported and this sometimes prevents some of our customers from engaging with us and really putting the Flings through its paces. By making EHC out of the box, not only are we officially supporting it but it will also make it easier for customers to try out this new interface. UPDATE (03/04/16) - It looks like I made a mistake and that the ESXi Embedded Host Client will NOT be released as a "Tech Preview" as previously mentioned but rather it will be officially GA'ed with vSphere 6.0 Update 2. 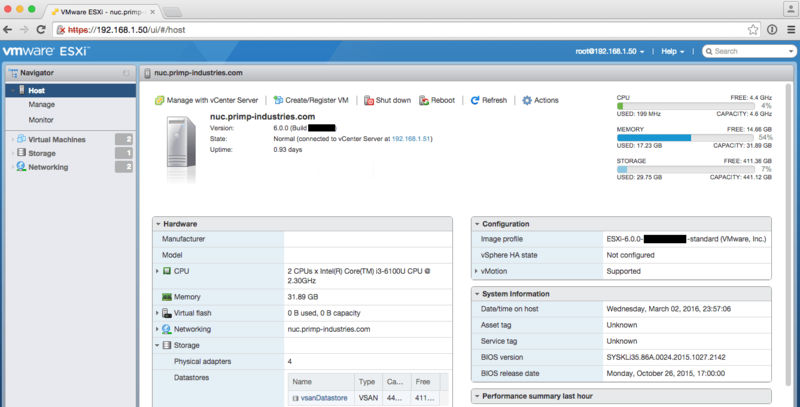 EHC is a fully supported feature of ESXi. Although EHC is very close to parity with the vSphere C# Client, it is still not 100% there. We will continue to improve its capabilities and if you have any feedback when trying out the EHC, do not hesitate and leave feedback or file a Feature Request through GSS. For those looking to live on the "edge" a bit more, we will still continue to release updates to the EHC Fling but if you want something that is stable, you can stick with the stock EHC included in ESXi 6.0 Update 2. We will still ship the legacy Windows vSphere C# Client, so you will not be forced to use this interface. However, it is no secret that VMware wants to get rid of the vSphere C# Client and that EHC is the future interface to standalone ESXi hosts. One feature that I know that many of you have been asking about is Free ESXi. Well, I am please to say that support for Free ESXi has been added in the latest version of EHC included with the upcoming ESXi 6.0 Update 2 release and below is a screenshot demonstrating that it is fully functional. Lastly, I just want to say that EHC has really morphed beyond just a "simple UI" for managing standalone ESXi hosts and has also enabled other teams at VMware to do some really amazing things and create new experiences with this interface. As I said earlier, this is just the beginning 😀 Happy Friday! Hi William – I too am excited about the EHC. However I have a question – you stated: “I was pleasantly surprised to see that ESXi Embedded Host Client (EHC) is now included out of the box with ESXi!” Do you mean that the latest public release of ESXi has the client, or that 6.0 Update 2 will/does? And, when 6.0 U2 comes out publicly, will the EHC still be a tech preview? Only curious because I know many of my clients may be turned off if EHC comes included but as tech preview in a full supported release. Thanks and great info as usual! Awesome – thanks William. I didn’t think VMware would ship U2 with a tech prev module but hey you never know! It will be officially available with Update 2 ? That is so cool ! William, can you comment on what features still need to be added to the EHC for it to be on par with the C# client? I’ve been using it for a few weeks and haven’t found anything missing. When will ESXi 6.0 Update 2 be released? Thanks. Fling v6 of EHC is available! Hi William, I try the EHC in 6.0 u2, is fantastic and speedy. When this client will be available for vCenter? One questions, can you change the kernel DG and DNS? Hi William, one of the few things we can’t find in the Embedded Host Client (vs. the C# client) is the ability to set the NIC Teaming to IP Hash, which is, unfortunately, one of the few things we need to set to get standalone boxes to work in a port channel configuration… Any chance that’ll get added to a future version or that we’ve just not clicked on things in the right way? Thanks for the feedback. I’ve not personally looked in-dept on the networking configurations, but let me ping the Engineer to see if he can comment further or at least add this to our list if it hasn’t already. We haven’t gotten to the NIC teaming part of the UI yet, I’m afraid. I’ll add it to the TODO list. 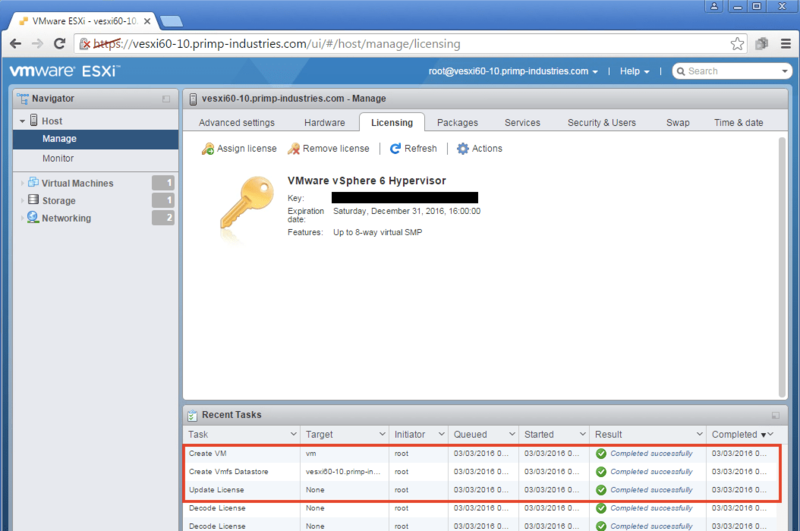 Can the embedded host client be restricted to specific ip’s to access it via the esxi firewall?